Ballet can be expensive but so can theatre and musicals. If you can afford tickets for U2 or Madonna, Hairspray or Legally Blonde The Musical, then ballet prices should not come as a shock. The key is to book as early as possible (first day of public booking) or as late as possible (day tickets and returns). Depending on the ballet, you should be able to find a mid–range seat for less than £50. For as little as £20 you can grab a seat in the amphiteatre sides or – if you are not keen on heights – stalls circle benches with restricted views are generally good value for money. For the price of a cinema ticket you can bag a supervalue day standing place or perhaps even a ticket for the ballet at your local cinema screen. Morphoses’ third London season has just come to a close. This year they came almost entirely depleted of their NYCB roster, something we lament since we cannot easily cross over the Atlantic to see that fabulous team at home. 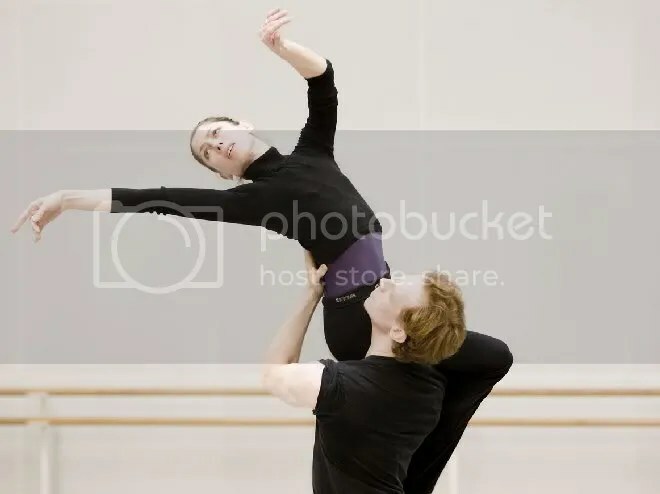 Nevertheless Morphoses remains a vibrant company providing the opportunity for an eclectic public to discover a mix of interesting dancers matched to new choreography. The programme I saw, a tribute to the Ballets Russes and their collaborative spirit, opened and closed with captivating works. 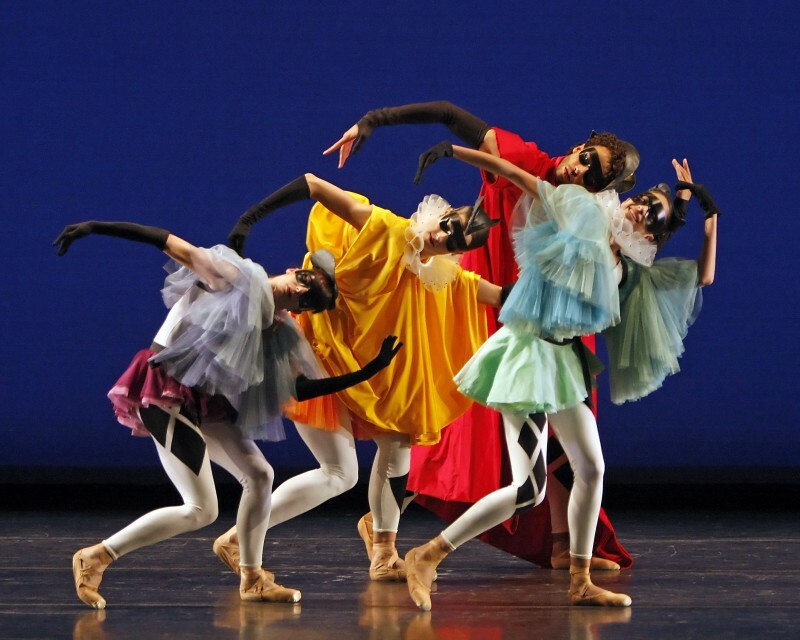 Wheeldon’s Commedia is a charming take on the carefree and playful world of the Commedia dell’arte to match Stravinsky’s Pulcinella suite, a spoof on early eighteenth-century music. The simplicity of the set and costumes, the absence of a corps de ballet reminds us that Morphoses works on a tight budget, but Wheeldon compensates by displaying his gift for fluid choreography added to what is essentially classical dance vocabulary. Although one wishes certain sections of the ballet were expanded on, particularly the solo sections for razor sharp Rory Hohenstein and sparkly Leanne Benjamin, on the whole this is a piece that makes a long trip to Sadler’s Wells on a wintry evening well worth it. So does Ratmansky’s Bolero, a fine translation into steps of Ravel’s music, also originally composed for The Ballets Russes. Three men (Juan Pablo Ledo, Edwaard Liang and Lucas Segovia) and three women (the always amazing Wendy Whelan, Melissa Barak and Danielle Rowe) dressed as athletes, gradually move from individuality to unison in response to the rising demands of the score. There are no set designs and, unlike the evening’s less strong middle section works, “Leaving Songs” and “Softly as I leave you”, no use of props to maximize dramatic impact. All the better to let the choreography speak. Tim Harbour’s Leaving Songs was supposed to be about endings and beginnings but stayed in the middle, mixing classical phrases with usual modern moves. It did have one good thing going for it, in the shape and extensions of Rubinald Pronk. Pronk’s chemistry with his regular dance partner Drew Jacoby could also be seen in the next piece “Softly as I Leave You” (by husband and wife team Paul Lightfoot and Sol Leon). Despite the recorded music and the overreliance on a wooden box for drama, there were luscious extensions and lifts as well as a sense of true intimacy between these amazing dancers. At the start of the performance Wheeldon greeted us with his trademark introduction to the evening’s pieces. But before each section there were also short video extracts on the dancers and/or choreographers. Those videos are a great idea but would perhaps grab us more if screened at the start of the performance or as part of DVD extras. With their third season done and dusted, what is next for Wheeldon’s company? It seems that Wheeldon’s initial plans for a permanent company of 20 dancers are still faraway and the fact that the second circle had plenty of empty seats is worrisome. Is Morphoses going to continue focusing on abstract pieces à la Balanchine because of lack of funding? That would be a shame given Wheeldon’s strength in narrative pieces. I left the theatre thinking that Commedia would also have worked as a narrative one-act ballet and hoping that seasons to come will be able to deliver that sort of thing. First of all, I am a great charlatan, although one of brilliance; second, I’m a great charmer; third, I’ve great nerve; fourth I’m a man with a great deal of logic and few principles; and fifth, I think I lack talent; but if you like, I think I’ve found my real calling — patronage of the arts. Everything has been given me but money — mais ça viendra. Sergei Diaghilev, in a letter to his stepmother. The centenary celebrations of the Ballets Russes continue worldwide. Here in London Sadler’s Wells Theatre has a week bookended by them. In the Spirit of Diaghilev having just finished its run, Morphoses now prepares to take over with an opening programme featuring works inspired by the legendary Diaghilev company. The Ballets Russes’ first appearance at the Théâtre du Châtelet in Paris on 18 May 1909 marked not only ballet’s ressurection in the West, but also its upgrade to a serious art form, no longer an antique resting on the laurels of the great Romantic era, no longer an appendix to opera. The fact that the Diaghilev troupe had been profoundly affected by political change in Russia made the art they created relevant, topical. Ballet was finally considered “cool”, an art that spoke and was spoken of, that was not afraid to experiment with subject matter and style. As we stare at the Royal Ballet’s new season, what better way to start than with the company’s veteran, Leanne Benjamin, who has danced for 17 years now and is still going strong. One of their most accomplished Principals, Leanne is ready to impress the crowds with her portrayal of the minxy Mary Vetsera in the opening night of Mayerling. With all the physical wear of tear caused by the profession, few ballerinas can be on the rise well into their forties, but this is exactly the case with Leanne Benjamin. Her technique is still solid and having been blessed with a cooperative physique, she has managed to keep growing thanks to old-fashioned hard work and discipline (she is known for rarely having missed class) and to a well-thought out choice of repertoire. These attributes and the fact she carries on excelling at full-length roles such as Juliet, Manon and Giselle have won her the admiration, not only of younger colleagues but also of bright modern choreographers such as Kim Brandstrup, Alastair Marriott, Wayne McGregor and last but not least Christopher Wheeldon (Leanne guests in his company Morphoses) for whom she is always on demand. For all of Leanne’s consistency and longevity as a performer it is surprising that her name is not as recognizable for the occasional ballet goer as that of some younger Principals. Her recent Giselle was full of depth and the MacMillan heroines suit her immensely: few can match the intensity of her Mary Vetsera (Mayerling), the complexity of her Manon, her metamorphosing Juliet. Leanne can leap from mighty Firebird to more contemporary works, where she displays luscious extensions and a pliant body, and yet she remains very much a connoisseur’s ballerina. Leanne was born in 1964 in Rockhampton, a small city in Queensland, Australia. To keep her busy, her parents signed her up for ballet at age 3, where she trained under the guidance of Valerie Hansen. During her childhood years she never put too much work into becoming a ballerina and it wasn’t until her sister Madonna entered the Royal Ballet School (RBS) that she felt she was up for the challenge. Two years later, aged 16, she followed her sister’s path and joined the class of 1980, at the same time as Royal Ballet’s Répétiteur (and former Principal dancer) Jonathan Cope. Training with Nancy Kilgore and Julia Farron, Leanne won the Adeline Genée Gold Medal in the same year she joined and the Prix de Lausanne one year later (1981). She caused such an impression dancing Giselle in her graduation workshop that both Ninette de Valois and Peter Wright offered her a contract to join their companies (respectively, The Royal Ballet and the Sadler’s Wells Royal Ballet – nowadays the Birmingham Royal Ballet). Thinking she would have more opportunity to dance soloist roles at the SWRB, Leanne accepted Peter Wright’s offer. She joined them in 1983 and bolted through the ranks to become a Principal in 1987. A hard worker who admits she needs the right conditions to perform at her best, Leanne thought at that point she needed a change, with more time to focus on individual performances and decided to go work for Peter Schaufuss who at the time directed the London Festival Ballet (now English National Ballet). The Festival Ballet’s focus on high technique was the perfect environment for Leanne to flourish and take on new roles such as Juliet in Ashton’s Romeo & Juliet and in Tetley‘s Sphinx. In 1988 Schaufuss left LFB for Deustche Oper Berlin, taking Leanne with him. But she would not linger in Berlin for too long, accepting in 1992 an invitation from Kenneth MacMillan to join the Royal Ballet as a first soloist. 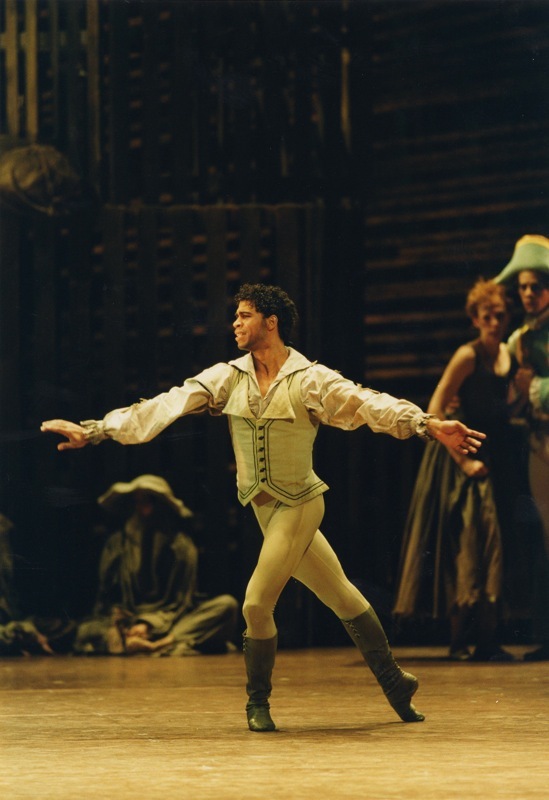 Leanne’s light jumps and long extensions (even though she is 1.57 m = 5 ft 2), along with solid interpretations of MacMillan’s female leads and other complex roles in general were a perfect match for the Royal Ballet’s theatrical style. She says she is a perfectionist and that she creates these roles by letting herself go with the music and reading the other dancers’s reactions to her own interpretation. As she matures she has become more motivated by one-act ballets and new roles created on her by some of today’s most renowned choreographers. She singles out her role in The Firebird as one of her greatest physical challenges but motherhood, she says, has been the biggest challenge of all and she considers herself very lucky to have been able to go back to her career and continue to bloom. Leanne has been partnered by many great dancers, but her more recent partnership with Edward Watson holds a special place in her heart. Watson has acknowledged Leanne is helping him become a better partner and it is clear they have a great deal of admiration and respect for one another. Their chemistry is evident, especially when they are dancing in MacMillan or modern pieces. Leanne has said in various occasions that she would have loved to dance Tatiana in Cranko‘s Onegin and perform more of the Neumeier repertoire or, like many dancers, Mats Ek pieces were it not for the fact that a toe joint problem prevents her from dancing off-pointe (and soft shoes are a given in Mats Ek’s choreography). As for the future, she has mentioned that she is not interested in choreographing and is more likely to pursue various interests outside dance. Leanne Benjamin found her own poetry in the dreamy cross-currents of Balanchine’s choreography; the slight hesitancy that dragged at her quick, bright jumps, the way her body yielded to gravity against the vertical lift of her leg both creating a paradoxical illusion of light and float. Judith Mackrell at The Guardian [link]. Booking for Mayerling, part of the ROH Autumn Season, already open. Winter Season public booking opens 20 October (Friends of Covent Garden priority booking opens 22 September). Leanne Benjamin Feature in Dance Europe July 2009. Now that we know what both the Royal Ballet’s and the Sadler’s Wells’ 2009/2010 dance seasons look like, it’s time to start penciling in dates, drawing cast plans, organizing bookings and, most importantly, cancelling any previous engagements. Because the autumn/winter dance season, after the starvation of summer months, supersedes anything else we may have had in the pipeline (weddings, birthdays, christenings…). Seriously. MacMillan’s gritty and sleazy classic will be back with solid casts – Ed Watson & Mara Galeazzi, Johan Kobborg & ? (since Alina’s online diary indicates she might not be dancing this, we’d love to see Leanne Benjamin) as well as some interesting debuts for Rupert Pennefather & Melissa Hamilton, Thiago Soares & Lauren Cuthbertson. Choreographers Sidi Larbi Cherkaoui / Javier De Frutos / Russell Maliphant & Wayne McGregor set about breaking new choreographic ground whilst paying homage to 100 year old Ballets Russes. Christopher Wheeldon joins in the Diaghilev fun with a special Ballets Russes selection of his own. We are thrilled to see Ed Watson (officially the busiest Royal Ballet dancer in the 2008/2009 season and going for another record, lucky we! ), Wendy Whelan and young Beatriz Stix-Brunell still with Morphoses for this new season. The first – and very edgy looking – triple bill of the season provides the opportunity to see the dream team of Cojocaru, McRae and Polunin again in a new production of Glen Tetley‘s Sphinx. Along with a new McGregor. We can’t wait. The bravura boss will be back at the Wells to perform Balanchine’s Apollo plus Jerome Robbins’ A Suite of Dances and Afternoon of a Faun. We think Sadler’s has gone a little “Ballets Russes PR happy” in comparing the man (albeit indirectly) to Nijinsky, but we forgive them: seeing Apollo in the programme is more than enough to lure us in. These days The Nutcracker is the most regular staple in the RB’s repertoire (I guess it’s trying to play catch with those 940+ Swan Lakes) but who can resist when high flyer Sergei Polunin is one of the princes? Plus, given that I can’t be bothered with yuletide decorations this is my only chance of seeing a proper Christmas tree.